Can I Play Daily Derby Online? Read 2 Reviews! No matter how many options you have to choose among, lotteries will more or less follow the same format. You choose numbers and you have to pick a correct sequence in order to win a prize. As great as this may be, it can potentially get repetitive. Luckily, lottery creators have come up with options for the people who want a bit of diversity. Daily Derby from California is one of these alternatives. It brings together two favorite things that many people have – horse racing and lotteries. While the game focuses on a mock horse race, it’s still a lot of fun and it promises some great prizes. Daily Derby is a daily (duh!) lottery that gives players a chance to purchase tickets prior to 6:30pm on the respective day of drawing. The main goal is to guess the top three winning horses and their race times. As you can see already, the concept is quite a lot different from what other state lotteries have to offer. The game is the creation of the California State Lottery and it’s popular both because of the unusual format and the high top prizes that players can win. Daily Derby was founded in 1998 and it was created to equal the excitement of the horse racing games. This is the first horse race-themed game to become available through an official state lottery organization. Online ticket purchases on the territory of California are also possible, making ticket buying easy and convenient. A single chance to win the top prize costs merely 2 dollars. Is California Daily Derby a Scam? If you’re not used to alternative lottery formats, you may think there’s something a bit sketchy about games like Daily Derby. Relax and calm down! 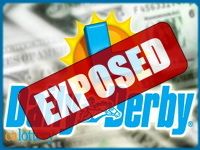 Daily Derby is completely legitimate and backed by the reputation of the California State Lottery. The California State Lottery was established in 1984 and it sold its very first lottery ticket on October 3, 1985. The organization was set up after the passing of the California State Lottery Act that was mainly created as an opportunity for generating extra funds for schools without increasing taxes. Apart from having Daily Derby in its portfolio, California State Lottery organizes an array of additional games. A few of the most prominent lotteries in the state include Daily 3, Daily 4, Fantasy 5, SuperLotto Plus, Mega Millions and Powerball. Scratch games are also available. All this being said means that Daily Derby is legitimate and backed by a state entity. You can confidently spend 2 dollars on the purchase of a ticket without ever worrying about being scammed. How to Play Daily Derby? Some people are put off by the alternative format – they worry that Daily Derby is difficult to play. They couldn’t be further from the truth. When buying a Daily Derby ticket, you have to choose your three favorite horses. Decide which one is going to finish first, which one will be second and which horse will finish third. In addition, you’ll have to choose a race time for each of the horses. The race times come in the range from 1:40:00 to 1:49:99. If you don’t want to make such a choice or you want to rely on luck, you can opt for three randomly generated numbers and race times. Here’s where things start to get really fun. California’s Daily Derby gives players 5 distinctive ways to win a prize. Obviously, the top prize is provided to the ones that guess the 3 winning horses and their race times. The grand prize for the trifecta and the correct race times will grow after each drawing if there’s no winner. Thus, the Daily Derby top prize can reach some pretty impressive sums. The biggest grand prize in the history of the game is slightly over 1 million dollars. It fell in October 2002 and the luckiest person in California was Bill Copeland from Hawthorne. The estimated grand prize per drawing is about 200,000 dollars, which is also pretty sweet. The numbers sound great, but how about the odds? They’re much more favorable than winning the top prize in some of the other most prominent US lotteries. Statistically, you have a 1 in 1,320,000 chance to guess all three winning horses and their times correctly. The second prize is provided to players who guess the three winning horses. The odds of this happening are much more favorable – 1 in 1,321. It’s impossible to pinpoint the exact sum that players will win because it varies from one drawing to the next. A trifecta can bring a prize ranging between 500 and more than 1,400 dollars, depending on the number of winners and the number of tickets bought for the respective drawing. Exacta or the third prize tier is for the ones that determine correctly the first and the second places. The odds are 1 in 147. A prize is also available for the players who guess the first place (odds of 1 in 13.2) and the ones that only guess the correct race times (1 in 1,001). Thus, players have 2 chances to win each time – they can win with horse names and they can win with the correct race times. This is one of the game’s most prominent characteristics that’s heavily determining for its popularity. All players have 180 days from the date of the respective Daily Derby draw to make a prize claim. If a claim isn’t made during this period, all of the money will go towards a California public education fund. Keep in mind that lottery prizes in California are subjected to federal taxes only (for sums of 599 dollars or higher). There’s no state tax that’s withheld. Tickets, featuring prizes from 1 to 599 dollars can be cashed out at any licensed retail venue. Alternatively, a claim form can be mailed to the California State Lottery headquarters in Sacramento. The mailing address is available at the official lottery website. Prizes that exceed 600 dollars can be claimed from a local Lottery District Office. There are nine such addresses throughout California. Alternatively, players can mail a claim form and their winning ticket to the California lottery headquarters. Can You Buy Daily Derby Tickets Online? As fun as the game is, Daily Derby is only available on the territory of California. Both people living in other states and non-US citizens can purchase tickets if they’re currently in California. Unfortunately, Daily Derby tickets can’t be bought through online lottery agents. Would you mind rating Daily Derby? Daily Derby has a unique lottery concept, which is why the game has a big number of devoted fans. If you want to try something a bit different, you should definitely test the game for yourself. To sum it up, this is a legitimate opportunity to win cash. It’s different from other state lotteries, which is always a nice feature. Daily Derby tickets cost only 2 dollars, which means you don’t have to spend a lot in order to test the opportunity and find out if it’s the right one for you. I’m mostly concerned about the treatment of the virtual horses. I visited their virtual stable and found them to be healthy and comfortable. What a riot. Run horse run! I love the concept of doing something different. Okay, so there is the issue of having to be in California, but at least they don’t take state taxes. I just thing this one is a riot. Nice to be able to play something different. And what you don’t win goes to education. Nice!